As the sun sets, Rosewood Theater comes to life with unique performances nightly. Upon entry you’ll be greeted by a host to welcome you and bring you to your table in the Theater. There a stage will light up with a variety of acts, creating a one of a kind experience every time you visit. The bar has an amber glow as the lights warm the whiskies staged below. The music is rhythmic and heavy. The room provides visual stimulation, on the stage and even through slightly-drawn curtains. A stairway to heaven in the far corner of the theater brings members-only guests to the Lounge where anything can happen. 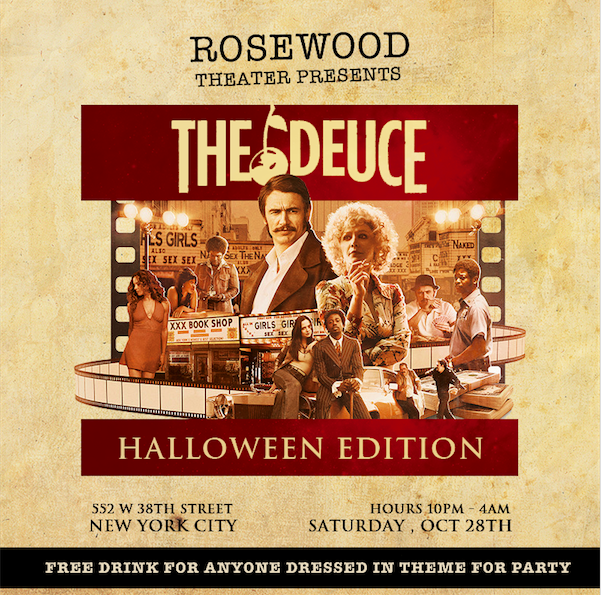 Rosewood Theater is a re-imagination of the staid, old-school gentleman’s clubs of yesteryear with an entirely new twist. Rosewood Theater is made for 2017. It’s a fully immersive adult playground catering to a discerning set of gentlemen and ladies with an appetite for adventure. Simply put, Rosewood is an urban refuge offering liberating experiences throughout. The Theater will debut a series of “Die Happy” lap dance parties, burlesque nights, dueling-pianos and Prosecco pong fetes. Guests are encouraged to get lost in the evening. Design: Designer Molly Clare Coyle was tapped to re-imagine the 10,000 square foot space that once housed HeadQuarters. The expansive two-floor venue boasts luxe leather banquettes to provide ample seating throughout, in addition to a striking center stage and two chandelier lit bars. A neon sign with “F*ck, Marry, Kill” in bright lights illuminates The Theater. Curtained off secluded spaces are spread across Rosewood Theater to allow for private shows for guests looking for an experience that can’t be shared. Menus: Rosewood Theater’s drink menu features signature cocktails like the Bettie Page, a Negroni Bramble made with Campari, Sake and Vermouth), The Dita Von, with Sweet Vermouth, Whiskey, Cherry Brandy and Orange Bitters and Jayne Mansfield with champagne and fresh grapefruit juice. Bottle service packages range from the Hush Hush for $295, which includes complimentary admission for up to six guests, VIP seating, one bottle of premium liquor and a bottle of champagne, to The Dom for $795 that includes complimentary admission for up to eight guests, VIP seating, and a special delivery of Dom Perignon Luminous and one bottle of premium liquor. A selection of small plates will also be available for purchase ranging from fig and truffle flatbread and zucchini crisps, to Jack Daniel chicken bites and Bulleit beef sliders.